All frp unlock or frp reset tool free download here in this article. If you are searching for how to unlock or reset Factory Reset Protection FRP on any Android smart phone having any version of Android operating system. This topic is very useful for Mobile Technicians or who repair Mobile phones or having phone repair shop, these useful frp unlock tool can help you to solve flashing and unlocking issues on any Android Mobile devices. So download all frp unlock tools and all frp reset tool for free and you will get all download links to the tools here in this tutorial. For MTK MediaTek Android phones, you can download Mediatek MTK frp reset/unlock tool and use it to unlock any MTK chipset phone runs on any version of Android operating system. The tool is very useful for Mobile repair personnel having a repair shop, to use this tool you need to download and install for free, no need to use any flashing box, just use this FRP unlock tool free and working without box. If you are unable skip the Wi-Fi connection page on the SPD phone after Hard Reset and it's asking to verify your account because the phone was reset, to continue sign in with a Google account that was previously synced on this device. That means you need the Factory Reset Protection FRP unlock to solve this problem on any Android device. Here you can download free SPD chipset frp unlock tool/reset tool for Android mobile phones having Spreadtrum SPD cpu, please visit the below link to download unlock tool latest version. Android Fastboot All USB Driver Download For FRP Unlock and Hard Reset. How to Flash with ADB Sideload Option. If the phone has Qualcomm cpu/chipset then you can use this tool to unlock frp lock or to do a reset of Factory reset protection on Android smart phones. The tool is free and you can download it here (from the below link) and very useful tool for unlocking frp on Qualcomm base smart phones. The tool is supproted many of the phone having Qualcomm chip-set such as Micromax, Lava, Xolo, Moto, Oppo, Vivo and Spice etc. Download All Qualcomm frp unlock tool free form the below link. So using these above frp unlock tools, you can unlock/reset/bypass frp lock of all most all Android smart phones, these tools are free and easy to use so download all frp unlock tool and enjoy happy unlocking of Android smart phones. 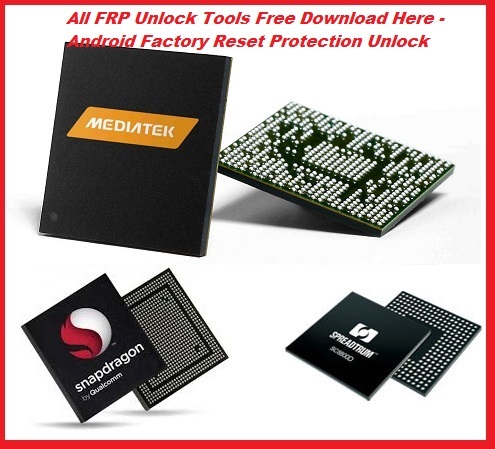 This is the all in one solution for frp unlock tool free download, frp bypass tool, frp reset tool, Android all in one frp unlock tool 2018 free download, factory reset protection unlock/reset/bypass tool, free frp unlock solutions available here.